With Indra Nooyi being replaced by Ramon Laguarta, the problem of low women representation in top jobs has returned to the limelight. We take a deeper look at the problem and what are some of its root cause. This is about the absence of real change, the reality of inadequate opportunities, and the grim reminder that “women can’t have it all”. Women make up less than five percent of the CEOs of major public corporations, and along with it runs the issues of pay disparity (women being paid less than their male counterparts). Indra Nooyi, the CEO of one of the biggest FMCG companies in the world, recently announced that she will be stepping down from her position at PepsiCo. As the company begins undertaking the change of leadership, the move marks the end of a12-year tenure where Indra Nooyi was responsible for navigating PepsiCo through a turbulent period marked with market changes, changing consumer preferences and even fending off harmful investor motives. As she steps down, she leaves behind an extensive legacy that her successor, the current company president Ramon Laguarta would hope to build on. Under Nooyi, the company grew its net revenue from $35 billion in 2006 to $63.5 billion in 2017. PepsiCo stock gained cumulatively 79 percent since she assumed the CEO role in October 2006. In addition to managing a steady business growth, she also was able to ensure the company remained untied as investor Nelson Peltz aimed at splitting the company in two. Although the change of leadership is often a welcoming sign as it injects a new vision and vigor into the company, the transfer of the role from Nooyi to Ramon Laguarta has signs of a much deeper problem that plagues much of the corporate world today. Being one of the longest-serving female CEOs in corporate America, her departure, and the subsequent appointment of a male CEO has raised questions on how accessible top positions remain for women. And quite rightly so! According to Catalyst, a research and consultancy company that advocates for more women in the workplace, of the entire S&P 500 companies only 25 find themselves being led by female CEOs. This number is poised to fall to 24 after the departure of Nooyi. Many have noted the slow but steady fall in the total number of women in top leadership positions across the globe. Fortune magazine in a recent study of its list of Most Powerful Women (MPW) noted that over the period of 2000 to 2015 almost 126 women fell off the list. Even as recent as 2017, almost 32 women were running Fortune 500 companies, a number that’s fallen to 24 now. Only 24 or 4.8 percent of the CEO positions in the Fortune 500 are currently held by women—a number that’s been stagnant for two years and has barely risen in the past decade. But it isn’t just that women are the only ones who have to abdicate their positions; men at the helm of companies are often held at equal standards and routinely step sown to make way for new talent to take up leadership roles. What makes such transfer of power problematic is the fact that women don’t figure talent succession plans in either of the cases. The significantly small percentage of women at leadership positions in some of the top companies across the globe is a result of this fact. An analysis done by Fortune on such transfer of leadership and corporate decision-making power notes that of the 50-odd women who have become CEOs of a Fortune 500 company since 2004, only two—Meg Whitman and Susan Cameron—have been able to repeat as a Fortune 500 CEO. When it comes to women leaders being succeeded by women, Spencer Stuart data reveals that there has just been one instance of that happening in across Fortune 500 companies in the past 5 years — Debra Crew succeeding Susan Cameron as head of tobacco giant Reynolds American Inc. But as fate would have it, the company was soon taken over British American Tobacco PLC and not long after, Debra Crew decided to step down from her position. Across key C-suite positions, according to data compiled from 222 major companies in the US by McKinsey & Co, women reportedly held only about 20 percent of executive jobs. The report noted that often senior women were in roles that didn’t have a direct impact on the bottom line, such as overseeing legal departments, rather than operational roles that directly impact bottom line performance, which is the typical path to becoming a CEO. The ease of access to top positions for men and women differs and points towards a deep-rooted systemic and perception problem. To begin with, many talent succession pipelines for women dry out and shrink by the time it comes to appointing the top boss. This is not to say that meritorious and skilled women don’t reach the top but rather that companies often function in a manner that lets many such prospective candidates slip out of their internal talent pools. Often found citing reasons like ‘eventual family restrictions’, many talent succession and development plans end up ignoring suitable women for critical positions within a company. When it comes to accepting women candidates from outside of the companies for top roles, there is high skepticism. This highlights the second major barrier to women becoming CEOs — the often male-dominated boards. As most board of directors still remain male-dominated, the lack of women in top positions doesn’t often emerge as a problem. Many believe that many of such board members are mostly from an age group which has quite rigid perceptions when it comes to gender roles. As equal opportunity employment and making the culture more inclusive for women become a priority among lower levels of the organization, and such intent to have a gender-equal board is yet to be achieved. And since boards play a major role in ensuring talent succession into the C-suite, misrepresented and skewed board structures often opt to go with men. Taking a look at how the boards of the Fortune 500 companies are structured, it comes as a little surprise that women make up only 20 percent of the board seats. The problem is similar when it comes to India. 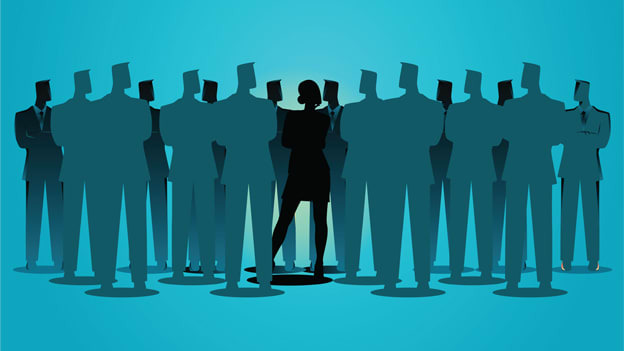 In 2014, the SEBI made it mandatory for listed companies to appoint at least one women board member. But this too has had a limited impact as a Deloitte study showed that till the end of last year only 15 percent of board seats in listed Indian companies were held by women. The number has grown since but in many cases, family members are appointed as board members to meet statutory requirements, a move that defeats the purpose of such legislation in the first place. Addressing such problems becomes the first step to fixing a succession system that for long has been losing out on quality talent because of its inefficient planning and skewed board compositions.